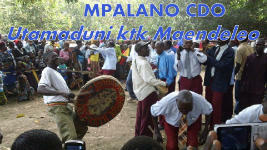 Mpalano strives to promote cultural activities of Tanzanian Communities for posterity’s heritage and as means to catalyzing sustainable community development. Mpalano Culture in Development (MPALANO CDO) added 5 News updates. Mpalano Culture in Development (MPALANO CDO) added a News update. Members of Mpalano CDO Board during board meeting in Dar es Salaam recently. Mpalano Culture in Development (MPALANO CDO) added 2 News updates. Mpalano Culture in Development (MPALANO CDO) updated its Team page.